Today there was a Weight Watchers 5km Walk-It Challenge, in association with the Running Room stores ... I didn't sign up for it because the closest Running Room is in the city... but we did do a 6 km walk this morning so I will be able to collect my 5K charm at the meeting on Friday morning. Hurray... love the bling! 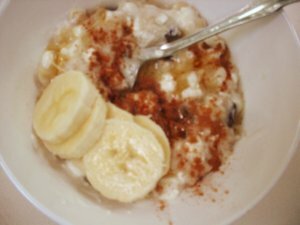 I cooked oats for our breakfast this morning and to add some protein to them, so that they fill me up for longer, I added some cottage cheese and raisins... stirred them into the hot oats and it was soooo good. I am definitely going to do this again. Lots of cinnamon, a bit of honey and a few slices of banana. Normally I am hungry a couple of hours after eating oats, but even after our walk, I was well satisfied till past our normal lunch time. 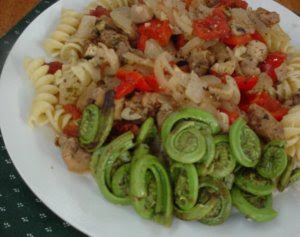 I cooked the fiddleheads last night and we had them alongside a really nice pasta dinner - mild Italian turkey sausage, with lots of veggies, garlic, and chuncky tomato sauce. They are a big pain to clean, but they are pretty darn tasty... sort of like asparagus and sorta like green peas!